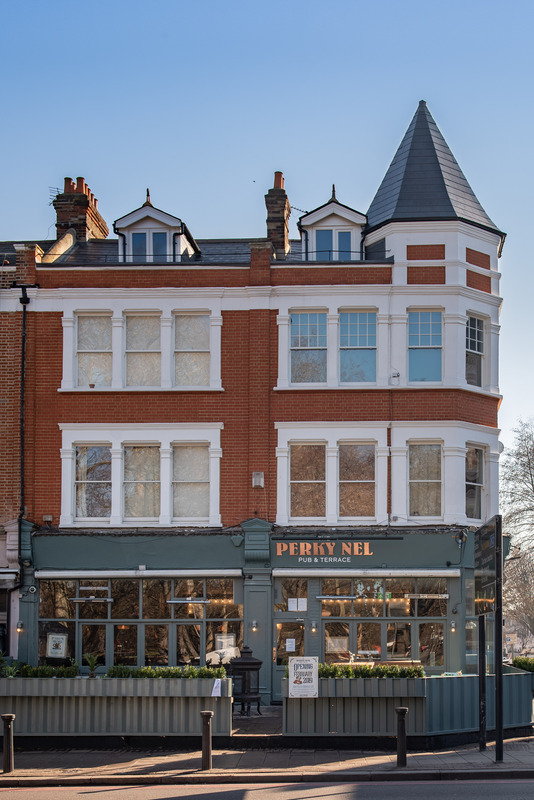 Ready to shower you with sunshine, quench a thirst, fill your belly and screen your sports, Clapham’s newest neighbourhood pub The Perky Nel has just opened its doors. Perking up Cavendish Parade, across the road from Clapham South station and directly opposite the Common, the new drinking and dining spot has launched with plenty to please local Claphamites and visitors alike. Out front, the pub’s large west-facing terrace is all set for sunny days with comfortable, colourful seating, festooned with pretty lights and plants. 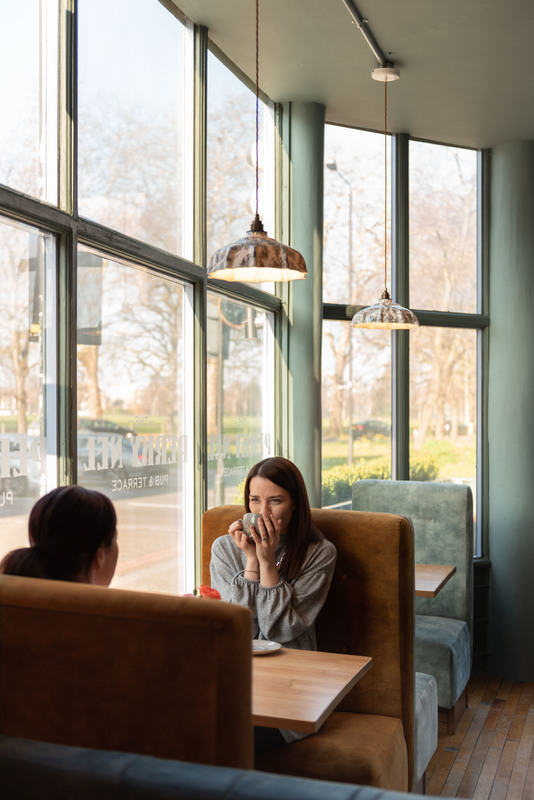 Whether it’s a coffee break, sundown prosecco pitstop or weekend brunch and bloody Marys, soak up some sun in the perfect spot for people-watching looking out over the Common. If the evening cools off, wrap up in one of the blankets, and snuggle under the heat lamps to stay nice and toasty. The whole place is dog-friendly so, once you’re done with that walk across The Common, stop in for dog bowls and treats for them and a well-earned drink for your good self. Inside, the light, welcoming front space provides both casual high tables and relaxed dining-height velvet banquettes to suit your style. Take a seat for friendly table service or order at the bar while you check out the drinks offering. Craft beers including Toast Ale brewed from surplus bread, locally-distilled spirits such as Balham born Hayman’s Gin and unusual softs (Square Root no alcohol G&T anyone?) sit alongside people pleasing and lesser-known wines. Classic cocktails are done right and come in at 2 for £10 all day on Thursdays for the venue’s Cocktail Club. Just like the drinks, food is done with minimal fuss to maximum effect. Expect pub classics but with added consideration. Brunch dishes are available from opening until 3pm on weekdays (midday at weekends with an option for bottomless bubbles); burgers can come gluten-free, bare and bunless, or vegan-friendly with bbq jackfruit; small plates act as starters or ideal sharers; while seasonal salads and specials continually change things up. Come the weekend and the ultimate Swingers Roasts from midday every Sunday offer all the meats, with all the trimmings on one piled-high board. What more could you want? Kid’s menus? Got ‘em. Daily specials? Got those too. Plenty of veggie and vegan choices? Sure thing. Get a glimpse of the chefs at work through the kitchen hatch at the back of the pub, framed by graffiti work from local street artists id-iom who have captured the heart of SW4 to create a large feature wall. Through the arch lies the pub’s entertainment area featuring three large screens for viewing your must-see fixtures from every angle. Book tables in advance to secure your favourite seats and enjoy table service throughout the match so you don’t have to miss a second spent queuing at the bar. A summer schedule of events and seasonal parties will keep things fresh rain or shine, while come the autumn locals will be brought in from the cold for the greatest pub tradition of all – the weekly pub quiz. 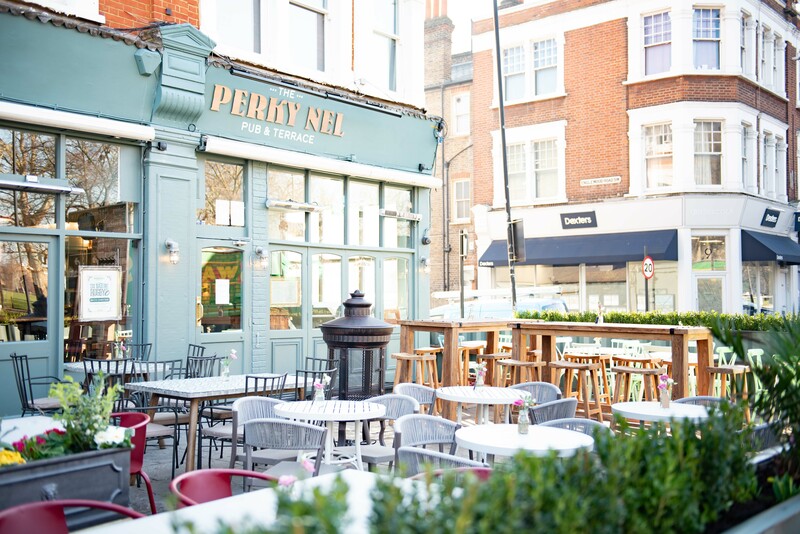 The Perky Nel is the second Clapham location for south London based, independent pub group Livelyhood, joining sister venue The Clapham North. The Livelyhood family also includes: The Regent (Balham), The Old Frizzle (Wimbledon), The Mere Scribbler (Streatham) and The Faber Fox (Crystal Palace). Come in and see Nel for a perky blinder of a lunchtime, evening or weekend. The new, lively local is right up your street.